Kevin Bond, Javier Eguiluz in #14057. A few months ago we decided to improve this situation by introducing a new Style Guide for Symfony Commands. These styles are available in Symfony 2.7, but we really started using them in Symfony 2.8. Using a web application analogy, these styles allow you to create console commands which are semantic and forget about their styling and behavior. Your commands just define "the HTML" and the style guide is "the Bootstrap and jQuery" that brings them to life. Symfony will take care about the styling details for you: it will change the font color, it will add a newline before and after the title and it will display the title text underlined. 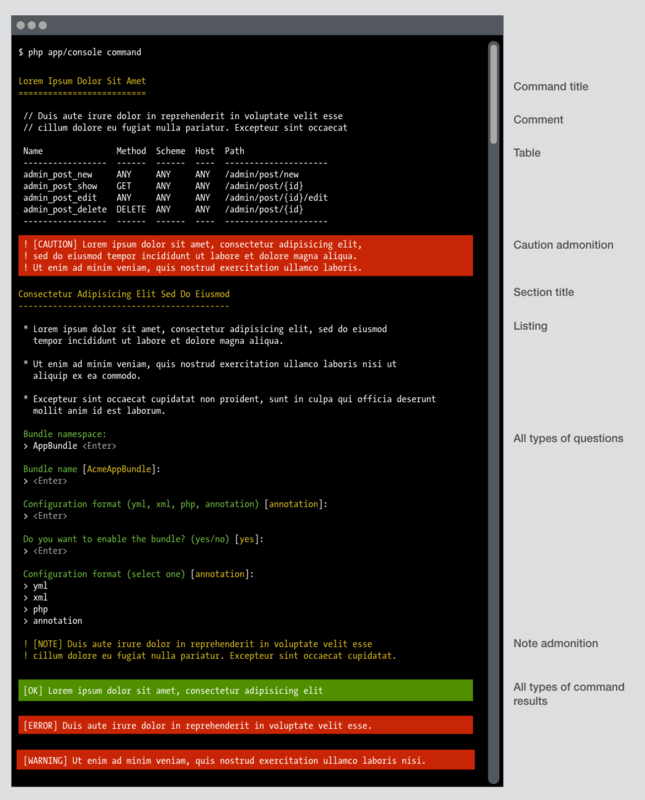 It makes your commands appearance consistent, saving you lots of time deciding which styles to apply for each command. It trims a lot of fat in your commands, shaving hundreds of lines dedicated to define the presentation of the information. Documentation is not ready yet for this style guide, but you can take a look at the source code of the built-in Symfony 2.8 or 3.0 commands, which have been completely redesigned. Awesome! Also remembers me a lot markdown, is it intentional? Very nice! I was really impressed by this feature at Symfonycon. Now I have tons of command to refactor with this !! @Emanuele it's not entirely intentional, but we wanted to provide a familiar and neutral look, nothing fancy or trendy. Glad to finally see a blog post about this feature ! Like you said in the SymfonyCon, very fast release! Congrats and Thanks! Another great example of DX! Great work Javier! This eases a lot the formatting for common sections present in majority of console commands. I Like it!!! great job! Is this feature in 3.0? @Martin, yes this feature is available in Symfony 3.0. I saw this new feature at Symfonycon, it' amazing. Saw it at SymfonyCon and now using SymfonyStyle in an import translations command. @Javier Eguiluz, what about interactive command testing? I mean that same feature http://symfony.com/doc/current/components/console/helpers/questionhelper.html#testing-a-command-that-expects-input is absent at this time in SymfonyStyle class. There is only one place where uses questionHelper https://github.com/symfony/symfony/blob/master/src/Symfony/Component/Console/Style/SymfonyStyle.php#L326 but it haven't provide setter for this private property. 326-328 lines can be deleted freely for now, if you will not add setter. Ahh yes, no more inventing my own styles! @Alexander I think you are right. You should probably create a new issue at https://github.com/symfony/symfony to discuss about this. Thanks for that! It's going to save us a lot of time!